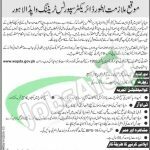 Here at this page you’ll have WAPDA Lahore Jobs 2016 for Director Sports Training Online Form Download. For all those applicants who are looking for the career opportunities in WAPDA so tap to this page now because the Water and Power Development Authority has put its step forward in the field of Sports recently in order to check and dig out the capabilities of the individuals to expose their hidden talent in the field of sports and is introducing its teams on international level and number of the times events, tournaments will be held under the supervision of WAPDA Sports Board and in whole of Pakistan camps have been set up. So, now recently for this step its sis seeking for the services of talented, caliber, capable and well disciplined applicants are required to fill the top class vacancy of Director Sports Training BPS-19 is vacant to apply. Appointment will be done on contract basis for the period of one year which can be extended further on the good conduct of the applicants. So, i have disclosed the post before you now its time to put before you its eligibility criteria as the applicants should served in Army forces as retired Colonel/Lieutenant and possess the relevant expertise in Sports, should be strict to the rules of WAPDA, should be able to cheer up the individuals for to play the game with heart and soul and promote the WAPDA Infrastructure, WAPDA Gymnansium, Swimming Pool and Ground and should produce the rest of the tools for tournament. Age limit should be 55 years. Attractive salary package will be given with fringe benefits. So, after having such details let's have a look on its applying criteria below. Interested and willing applicants are required to apply and obtain the application from from the given link below. Last date for applying is 12th December 2016. Duly filled application should be submitted with the educational and experience certificates, CNIC, Domicile and two recent passport size photographs should be attached with the application form and reach to the said address. So, keep in touch with this page for more such posts. Address: Director General, (HR & Admin) 301, WAPDA House Lahore.